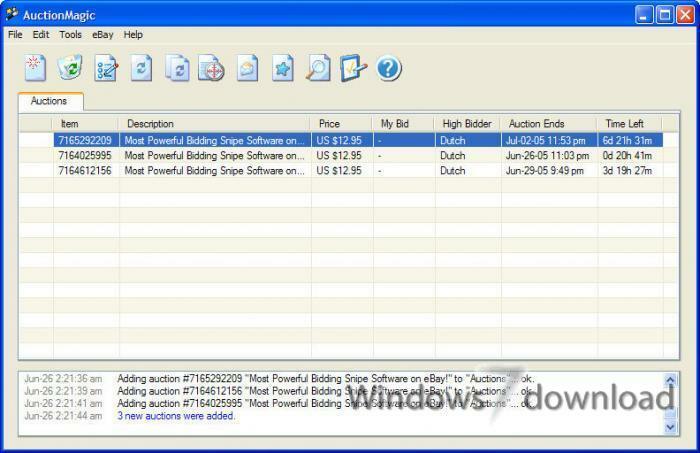 AuctionMagic is the most powerful bidding and auction management software available on eBay. It will track you auctions and place your bids moments before the auctions close to greatly increase your chances of winning. AuctionMagic is the pioneers in eBay software,with the original released back in 1998. The current version was rewritten last year from the ground-up using the latest and most powerful programming language available from Microsoft. AuctionMagic is the most powerful bidding and auction management software available on eBay. It will track you auctions and place your bids moments before the auctions close to greatly increase your chances of winning. AuctionMagic is the pioneers in eBay software, with the original released back in 1998. The current version was rewritten last year from the ground-up using the latest and most powerful programming language available from Microsoft. · By placing bids at the last possible second before an auction closes, known as sniping, you can ensure you're the last bidder. No one has time to see your bid and counter it before the auction closes. · Selective bidding with Bid Logic lets you only bid on the auction if it meets certain conditions based on the results of your other auctions. This way you can have it bidding on the same item from different sellers until one wins, or only bid on an accessory if you win the main item first. · Synchronizes your PC to eBay's clock so your bids go in exactly when you want them to. · There are many ways to quickly add new auctions, even in the background. Integration with web browsers including Internet Explorer, Firefox, and Opera. Automatically add all items you've bidding on, selling, or watching. · Keep up with what your auctions are doing with desktop alerts, sound effects, emails, and text messages, letting you know when things have changed. · Keep track of auctions you've purchased, including contact and tracking information, dates, and costs. It also stores a complete copy of the item's description with pictures, so you'll have a record even if it changes or when eBay eventually removes it. · Automatically checks for new updates so you're always using the latest version. Updates are available for free. · Supports international eBay sites and currencies. All AuctionMagic reviews, submitted ratings and written comments become the sole property of Windows 7 download. You acknowledge that you, not windows7download, are responsible for the contents of your submission. However, windows7download reserves the right to remove or refuse to post any submission for any reason. Windows 7 Download periodically updates pricing and software information of AuctionMagic full version from the publisher, but some information may be out-of-date. You should confirm all information. Using warez version, crack, warez passwords, patches, serial numbers, registration codes, key generator, pirate key, keymaker or keygen for AuctionMagic license key is illegal and prevent future development of AuctionMagic. Download links are directly from our mirrors or publisher's website, AuctionMagic torrent or shared files from free file sharing and free upload services, including Rapidshare, MegaUpload, YouSendIt, SendSpace, DepositFiles, DivShare, HellShare, HotFile, FileServe or MediaFire, are not used.